Are you dreaming of becoming the ultimate penetration tester? Get to learn more practical skills on top of theoretical ones? Or you simply want to learn new tricks and get that promotion you deserve? Our bundles will allow you continuous growth, training after training, while saving big on registration fees. The current bundles will not be available anymore for new enrollments after April 30 2018, 11:59pm PDT. If you are already enrolled or still do so before that deadline, then you can, of course, enjoy whatever courses you are enrolled in. With the ever-growing digital threat environment, increasing demand and job opportunities in the InfoSec fields, having the knowledge AND practical skills is a crucial point to your career’s growth. From “The Elite Pentester” and the “4-In-A-Box” to the “All Access Pass”, numerous students have seen their practical skills and theoretical knowledge rise. The @eLearnSecurity forum is just awesome! If i have problems to complete a task, the instructors and the people help me to accomplish my goals in very little time. Also wanted to mention and give a shout out to @eLearnSecurity for providing such awesome training and giving me the skills needed to actually be able to reach out and grab a job within Cyber Security! @eLearnSecurity you guys are awesome!!! PTP (Penetration Testing Professional): the most comprehensive and practical online course on Penetration Testing, and Network Pentesting. It takes you from the basics to a professional level. WAPT (Web Application Penetration Testing): the most practical AND professionally oriented certification you can obtain in Web Application PenTesting. Both Penetration Testing training courses are in Elite Edition and valued at $2,598. Save $ 600 and get them now for $ 1,999. 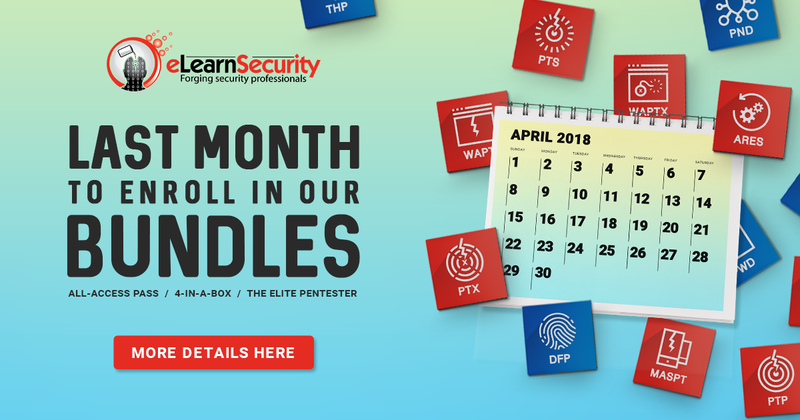 Bundle any 4 out of our online IT Security training courses in the Elite Edition and get lifetime access to each of your four chosen courses, infinity exam vouchers and up to 120 usable hours per course in our industry-leading virtual labs for hands-on training. You’ll end up being an IT Security expert with up to 4 new certifications. This bundle covers 4 training courses of your choice in Elite Edition and is valued up to $ 6,396. Save up to $ 1,750 and get it now for $ 4,599. Get lifetime access to each of our training courses in the Elite Edition, including the hands-on lab hours, the exam voucher and unlimited access to the training materials. You can end up with 11 new certifications and become an expert in IT Security. This bundle covers all of our current training courses in Elite Edition and is valued at $ 14,189. Save up to $ 6,100 and get it now for $ 7,999. IN SHORT: Bundles are available for enrollment until April 30th 2018 after which they will no longer be available. If you have any question regarding the bundles’, don’t hesitate to contact us on Social Media or wave over in the comments section. For more practical inquiries, please contact our support team at support(at)elearnsecurity.com.